The Sealmaster Magneta® series consists of a complete range manually operated impulse sealers with different sized models and options. This user friendly and safe machine is ideal for packing small and medium sized series. 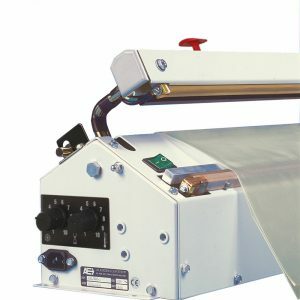 The machine can work with pre-made bags as well as with tubular foil. When working with tubular foil, the machine can produce various length bags by using the integrated shielded cutting device. This bi-active model of the Magneta is equipped with two sealing bars, one in the arm and one in the machine. Thanks to the two sealing bars this machine is much more power full than a standard machine. It can seal thick films up to 2x 0,25mm.